Alkira is a beautiful tranquil getaway from the frantic pace of city life. 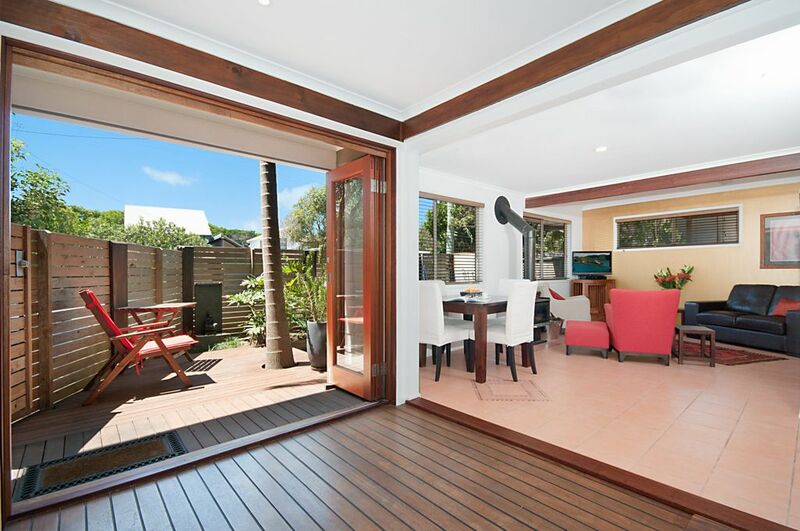 This two bedroom villa is located just 50 meters from one of Byron's best surf beaches. Start your day by heading down to the beach to catch your first morning wave as the sun rises over the horizon, or take your dog for an early morning beach walk,or just grab a coffee and sit and watch the sunrise. You may even spot a whale or some dolphins frolicking in the surf. Alkira is a light and airy spacious retreat for a romantic getaway any time of the year. Alternatively, it is a great space for a small family or 2 couples. Well behaved pets are welcome. The ground floor has an open plan living area that overlooks a private courtyard. It features louvre windows, high ceilings and fans to catch the sea breezes making the villa cool in summer, while a cosy romantic fireplace provides wintertime warmth. An additional sunroom area extends the living space and provides a separate nook where you can spend an afternoon reading or snoozing in comfort and let the kids watch TV. The villa is equipped with Foxtel, Blu-Ray DVD, stereo with IPod dock facilities and complimentary Wi-Fi. The sunroom opens through bi-fold doors to the compact and smart courtyard. There is an electric BBQ and outdoor shower with hot and cold water, perfect after a refreshing swim at the beach. The courtyard captures the morning sun yet is well shaded in the afternoons when you want to relax in a cool tranquil space. The kitchen is very well equipped and has everything you need to cook up a storm including a coffee machine and a vegetable juicer for you to kick start the morning. The villa is one of two and is situated at the front of the property with a private entrance and has no shared walls or ceilings. It can accommodate four people in two bedrooms upstairs both with queen sized beds. The master bedroom is generous in size with a large desk (if you must work), and a sunny balcony where you can relax with a good book. The bathroom has a separate bath tub and shower. There is a second toilet in the fully equipped laundry downstairs. Suffolk Park is a great base to explore the beautiful hinterland and all that Byron Bay and its surrounds have to offer. There is a fabulous bike track at the northern end of Alcorn St for an easy bike ride into town and an hourly local bus service into Byron Bay. The Suffolk Park village shops include a supermarket, chemist, pub with bistro and bottle shop, casual restaurants and a very popular gourmet bakery. House Rules: This property is not a party house. There will be zero tolerance for parties, rowdy behaviour or noisy guests. No smoking indoors please. Small pets are welcome - please advise if you are bringing a pet. Schoolie suitable properties are specifically advertised as such and have a specific schoolies tariff.Â Schoolie bookings are a minimum 7 nights with Saturday check in and check out. At managing agentâs discretion, there may be minimal flexibility re above dates on request. Byron Beach Realty and/or the Owner are not responsible for the tenantâs personal property. In the event that the property is offered for sale, the tenant agrees to allow the owner or an agent to inspect the property with prospective purchasers by appointment during reasonable hours with 48 hoursâ notice. Noise is defined as any sound that can be heard from neighbouring properties that disturbs their peace & quiet, including arrivals & departures particularly at night. Please keep noise to an absolute minimum in outdoor entertainment, pool and spa areas between 9:00pm â 8:00am. This property is a member of the Holiday Letting Organisation who operate a neighbourhood hotline for noise complaints and other matters. They have a Two Strikes and Youâre Out policy. This can result in fines and/or eviction from the property. If a noise complaint ( first strike ) is received during your tenancy, and security is called out, a $165 charge will automatically be deducted from your security deposit. Should a second complaint (second strike) be received, a further $165 will be charged against your security deposit, you will be evicted from the property and the tenancy terminated on the spot, without refund of any rent monies paid. Tariffs are subject to change without notice until deposit payment has been received. A deposit of 50% is required to confirm booking and the 50% balance is payable 30 days prior to arrival. We charge a $55 non-refundable booking fee. Keys will only be released when all outstanding monies due, have been received. Instant Bookings will attract a 2.459% credit card fee. A $1000 security bond pre-authorisation is required prior to arrival. Schoolies bookings will require a $2000 security bond pre-authorisation. No money will be deducted from your card unless we need to make a claim against your security bond (this money will remain as unavailable funds for up to 31 days after vacating). If you are paying via Direct Debit we require a Pre-Authorisation Credit Card form to be processed prior to arrival. Claims may include but are not limited to the following: excess cleaning fees, excess garbage removal, damage or breakages at the property, late check out, security guard call out. All cancellations will incur an administrative fee of $100. Â For cancellations within 60 days of arrival, the total amount paid will be retained and all efforts will be made to re-book the property at the same tariff. Should we successfully re-book the property, all monies, less a $100 admin fee, will be refunded. All changes and cancellations must be provided in writing. Great location right opposite the dog beach. We preferred staying here rather than in BB. The property had everything we wanted. We thoroughly enjoyed our stay at Alkira. A lovely place in a great location and so close to the dog beach. We will certainly be booking another stay at Alkira.